Dark Horse is pleased to announce its 2006 Free Comic Book Day offering will be in the form of a special split issue featuring original Star Wars and Conan material. Each story is ten pages long and the content for both is appropriate for all ages. Our Star Wars tale "Routine Valor" is set during the Clone Wars and features Commander Cody and his troops in an indefensible position facing an unassailable enemy. Star Wars: Routine Valor features story by Randy Stradley with art by Doug Wheatley. In the Conan story "The Spear," a sorcerer receives a vision about a tremendous force washing over the world, and decides it's a prophecy ordering him to revive his sleeping god - but he should have considered it fair warning about his own run-in with Conan! "The Spear" features story by Tim Truman with art by Paul Lee and Dave Stewart. 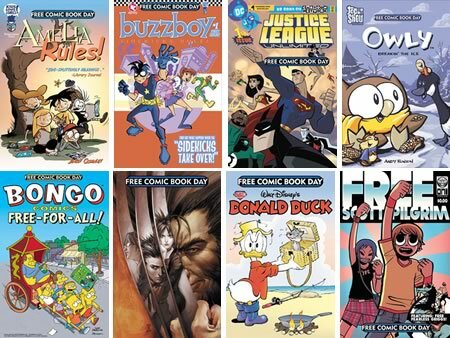 Free Comic Book Day is Saturday May 6, 2006. Please Note: Availability of Silver Sponsor titles and additional items may vary between participating stores, so please check with your retailer for availability. 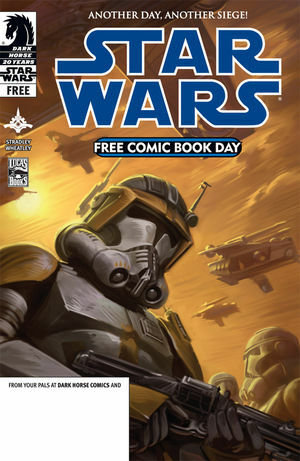 Images for this year's titles can be found online at the Free Comic Book Day website, http://www.freecomicbookday.com. Also on tap for Free Comic Book Day: Viz Media will publish Viz Samplers for manga lovers; WizKids LLC will create a Marvel HeroClix Wolverine Figure for players of its popular collectible Miniatures Game; and Diamond Select Toys & Collectibles will give toy collectors an exciting new addition with its Stargate Jack O'Neil Action Figure from the highly anticipated toy line based on the hit Sci Fi Channel series. Please Note: Availability of these items may vary between participating stores. Please check with your retailer.